War's long been a mainstay in fantasy literature, and it can be argued D&D itself came out of trying to simulate that. Lord of the Rings, Nine Princes in Amber, A Game of Thrones and many others feature the clash of armies. The question is how to bring that to the table? Do players control the armies? Are they caught in the middle of such battles? Do wars have repercussions across the campaign setting? Many fantasy RPGs have tackled these issues with vastly different approaches to scale, player role and focus. The following list presents fantasy games or supplements which include rules for mass combat, warfare, military campaigns or the like. Some of these systems offer quick resolution, others the means to play out a full battle, a few detail strong player involvement, and small number cover secondary issues relating to war (life in an army, recruitment, fallout from campaigns). I've concentrated on classic fantasy games, though I know there are a few warfare supplements for other genres. I should note that I've lumped together a number of generic d20 "warfare" supplements into one entry on the list for convenience sake (#10 War). I’ve arranged this somewhat chronologically. Of course D&D came out of Chainmail, a set of miniatures rules. It is interesting to see how role-playing evolved from miniatures and board/war gaming and how that affiliation has swung back and forth over the years. Some games lend themselves to more strategic thinking, some to more tactical. I think a real distinction can be drawn as to how much players consider what they're doing a "game" in the classic sense. Swords & Spells is the last of the early D&D supplements (though not numbered in the series). It attempts to bring Chainmail up to date with the advancements in the RPG. So what you have is a set of rules for handling larger and mass scale engagements in D&D with miniatures and the like. The idea being that you need a streamlined system to handle that scale. Bushido's one of the great and under-appreciated RPGs. The sheer density of the material- historical and fantastic remains incredible. The first rpg to treat a pseudo-historical Japan, it presented a ton of material. It has depth and wonderful details, blending together traditions to create verisimilitude. It still has some of the best treatments of Japanese religion for a fantasy setting. reading it you can see how it set the stage for Oriental Adventures and Legend of the Five Rings. It is also the first RPG I'm aware of to include an abstract system for resolving mass battles, while at the same time allowing players to have a role in them. You have a battle table, where players can impact the battle, take wounds, or have a single combat with a named foe. A large section covers honors received after the battle as well. It holds together well- a system that doesn't require miniatures but allows PCs some interaction and control in the events. 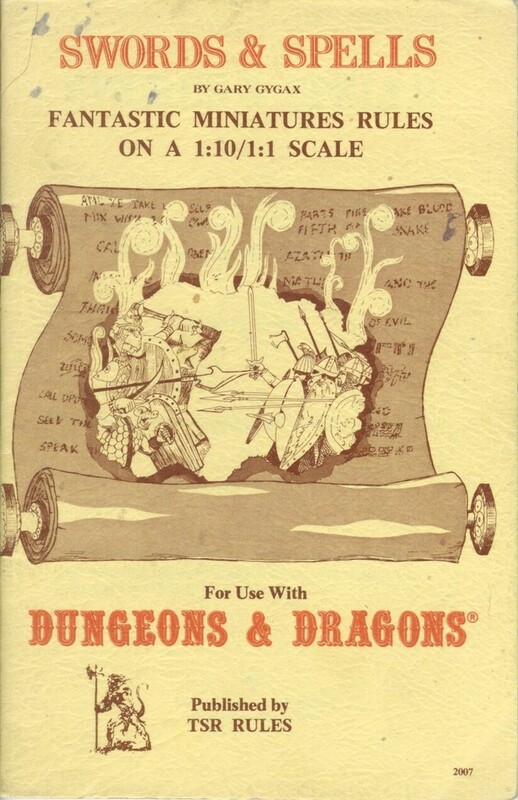 Basic Dungeons & Dragons first offered abstract rules for handling kingdoms and warfare with this set. Called "War Machine," it would later be expanded by "Sea Machine" a set of naval warfare rules. 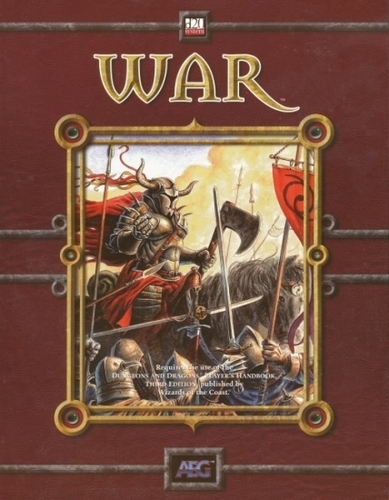 Oddly when War machine was rewritten and clarified for the Dungeons & Dragons Rules Cyclopedia they expanded the Siege Machine rules, but left out the naval portion. 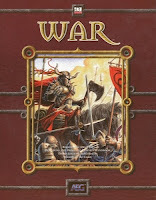 War Machine offered a nice set of guidelines for detailing kingdoms and armies throughout the Gazetteer series. The rules abstract the forces, but have a surprisingly high level of detail for tracking forces and battles. Some issues like supplies are considered as well the impact of some D&D magic. Unlike Bushido's approach, while the players can have some impact through leadership and the like, there's no built in mechanism to zoom down to the PC level. My reference for this is King Arthur Pendragon (4th Edition), but I assume some form of the battle rules presented here appeared in the earlier edition. Notably the battle mechanics are presented as part of a PC Knight's "Chivalric Duties." As with most of the earlier systems, Pendragon focuses on the battles as events (with less consideration given to campaigning and secondary issues). The rules do a nice job of breaking down and explaining the traditional levels and forms of mass combat for the setting. The rules look to resolving the outcome of the battle, but with a focus on describing the PC's roles within that. Random adversaries can be encountered and fought on the field. The rules actually have some detailed steps to work through, with significant record-keeping. Post-battle systems include ransoms, plunder and glory. This was a huge product when it came out. I'd grown up running the line between wargaming and rpgs- we had a big group of old school miniatures people who had run kids-friendly events at local conventions. I had a decent supply of unpainted figs, so I bought this immediately. I had hopes of a nice system to add mass combat to our tabletop rpgs. The book completely overwhelmed me- dense with rules, complicated systems and clearly more a miniatures systems than something which played nice with AD&D. Wjhile it contained some campaign rules, those felt like an add on rather than the focus. It was really the first time I realized that AD&D and what TSR was doing wasn't what I was interested in. Among the earliest supplements for GURPS, Horseclans was an odd duck. I'd read some of the novels which seemed really retro and more "Men's Adventure" than high fantasy. I picked it up as I did everything in the early days for GURPS. I liked the mass combat system which offered a really simple set of mechanics for resolving battles during a game, tracking forces, and allowing players to have some role in the action. It reminded my most of the Bushido approach. it still lacked details on campaigning and campaign life. The Mass Combat rules here would continue to get used and shaped in later GURPS books, notably GURPS Conan. Art Lyon ran a local campaign of that and used those rules a couple of time. There was a point when I bought just about everything for Rolemaster. I used a lot of the options, but I still tried to maintain some simplicity to the system. This and Sea Law went too far. If you've played Rolemaster you can imagine what's here- a crazily detailed system for generating units, detailed army and maneuver systems, counters and hex maps, and page after page of charts. On its own it seems like an overly complicated battle simulation system, and it doesn't do much to integrate with tabletop rpg aspects. What's missing is how you actually make this an interesting part of play. There's something of an irony for me that none of the classic TSR settings I really love (Mystara, Planescape, and Birthright) survived the transition to 3rd edition or beyond. Birthright remains a strikingly ambitious game concept- an entirely new world built; on fundamental changes to the structure of power and magic; PCs operating a larger scale of time & control with domain actions; and a built in detailed and distinct system for managing mass combat and warfare. Though other games have taken on rulership, I don't think any have reached as far as Birthright. Campaigning and the issues associated with that have a central place in the setting. Of course things are approached top down- so the actual on the ground, nitty-gritty of what war might look like to PCs isn't as big an issue. 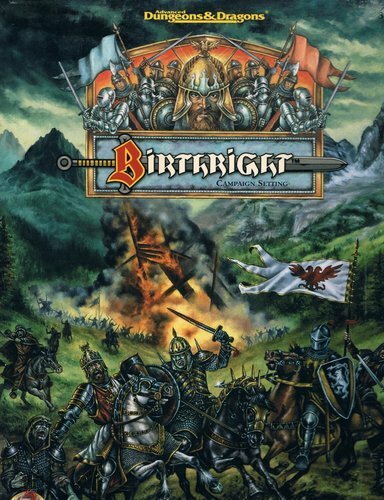 Birthright contains its own pseudo-boardgame system for managing the clash of armies, with many supplements adding new forces (and display cards). A naval warfare system, Naval Battle Rules: The Seas of Cerilia, arrived late in the setting's life cycle. 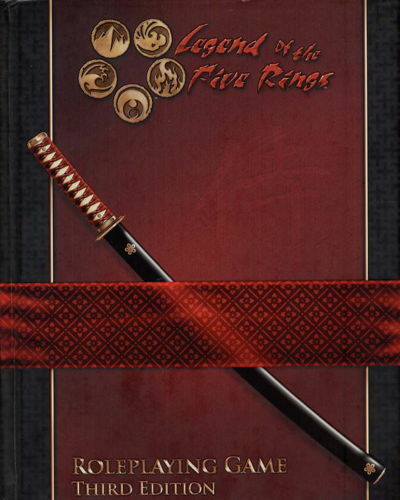 The first edition of L5R's a model of economy. Messy in layout and presentation, it manages to get all of the essential tools players & GMs need to run a campaign in a single book. Later editions experienced a degree of bloat they combated with smaller fonts and tighter text design. The Battle system presented here focuses on resolving player roles in battles established by the GM. They serve as set pieces for the game. The mechanics allow players to choose their approach (in reserves, at the front lines, etc) and then roll based on that to see what happens. They can take wounds, gain glory, begin a duel, or meet a heroic opportunity. The list of opportunities presents an excellent resource for the GM. These rules take up four pages total. There's little about campaigning, command or strategic issues, but I like the focus on player encounters in battle. It would be an easy mechanic to lift out for other games. One of the interesting things to come out of the d20 movement were "topic" books, aimed at exploring certain aspects of a fantasy campaign. AEG put together may of these as did other companies. I'd point to Living Imagination, Inc's Charge!, Otherworld's Mercenaries: Born of Blood, Eden's Fields of Blood: The Book of War, and AEG's Mercenaries. These supplements have a tough goal in front of them- offer a compelling system for resolving mass combat while managing to integrate the ever-expanding concepts for the d20 system. How do you deal with magic- in the particular or in the specific? Many of them offer new prestige classes, new magic, new feats and even new base classes. Some of the books do seem to cover other topics- beyond just new character options and systems for resolving battles. Some deal with campaigning, life in an army, recruitment and other details which add color to these issues at the table. However figuring out which one is right may be difficult. So many of these books came and went quickly. The difficulties more for non-d20 GMs- is the material presented adaptable or even interesting enough to warrant picking up? As opposed to the generic d20 warfare sourcebooks mentioned above, The Black Company provides those concepts in the context of a unique setting. I've bought many licensed setting books over the years, and Green Ronin's treatment of the Glen Cook series remains one of the best. They manage to capture the character of the novels, adapt the mechanics to that, and provide new and interesting general options for d20. It is amazingly well put together. The rules provide a framework for running a company-level mercenary campaign. The includes building the company. Management of that such as recruitment and finances are dealt with lightly. That material has potential, but could have easily been expanded. More usefully the book offers a sense of what life is like for these companies- and how that might be translated for the PCs. Combat rules are provided for handling different scales of conflict. The Company scale allows players to control units, which act as collective creatures pitted against one another. Beyond that players can even engage in battles at the Army scale. This uses a more abstract set of mechanics. 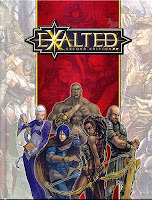 The first edition of Exalted talked about the concept of war, but offered little in the way of tools for managing that. The second edition adds material the setting really needed. Twelve pages of rules cover this area. Interestingly the rules take the approach of simply raising the scale in some ways. Most of the standard mechanics now apply, but the battles focus on commanders operating on an abstract field. Units and forces act as bonuses to those commanders. The rules offer options for special maneuvers on the field, drilling troops, troop quality, exhaustion, and morale. Charms and magic of special characters apply in a generic way and duels can be initiated to zoom down to the individual level. 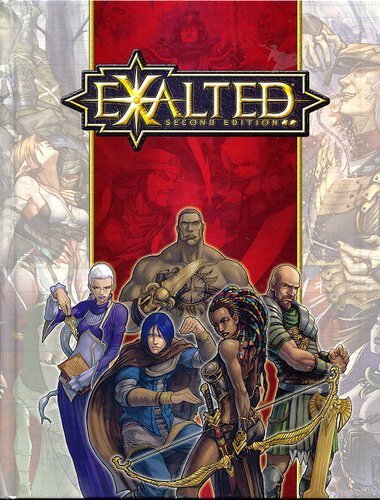 I don't care for the core combat engine in Exalted 2e, but the interesting rules and options given here could be ported as a system to another game. There's isn't very much on the campaigning side of things, but the comprehensive mass combat rules offer strong player participation. Reign can be used as it own fantasy setting or as a supplemental system for other rpgs. Greg Stolze has created several different Reign settings, each with distinct premises. The basic tools of the system play out very differently depending on those details. Reign focuses on larger scale groups: guilds, mercenary companies, armies or even nations. Somehow the rules manage to be abstract and detailed at the same time. Anything can interact with anything else, and warfare's one (albeit important) mode of conflict. Campaigns and wars can easily be modeled, and a battle's easy to resolve. While it is possible to zoom in to the individual level, the rules and approach favor the collective, god's eye view. I've become a fan of FATE over the last year or so. 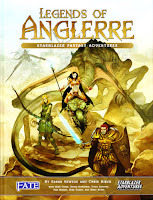 Legends of Anglerre helped push me in that direction. It offers a toolkit for modeling many different concepts at vastly different levels- while maintaining a coherent set of mechanics across those scales. Anything can be modeled as a character, with its own skills, stunts and stress. It makes sense in the context and is simple to set up and adjudicate. The rules offer extensive material on building organizations, including armies, keeps, war machines and the like. New options are presented for each of those types. A solid abstract system considers specific conflicts bu breaking them into zones in which the forces battle. There's something of a mix of Reign's abstraction with Exalted's approach to playing out battles via the same method as standard combat. Campaigns can be played out as a set of obstacles or as management of plot stress issues. The interaction of the individual (usually the PCs) with those scales of conflict isn't a clear as it could be. Given that you'll usually want to be able to zone down to that, the GM will have to figure out some approaches which work for them. Sourcebook presenting establishments for a port city, useable with most fantasy rpgs. The first Citybook seems to have been intended as a one-off supplement, at least that’s the sense I have from the tone of the introduction. While the first volume took a classic or even generic approach to the establishments presented, Citybook II: Port o’ Call takes on a theme. We'll see that for the rest of the series, with each volume loosely tied to a central concept. So now we have a book of revolving around ports, ships and maritime atmosphere. I’ve had a couple of significant port cities in my own fantasy campaigns. One of was a fantasy/steampunk version of Al Amarja set in Ierendi; the other a threshold city in a Dragon-Blooded campaign. 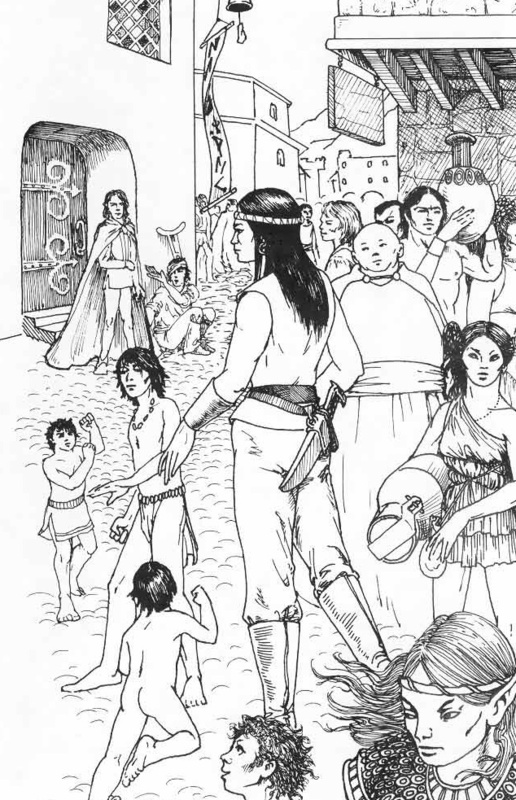 Plus I’ve taken groups through ports in published settings (Corflu from Glorantha, Bozisha-Dar from MERP). I tried to offer some of the feel of a port, but I don’t think I delved into those elements deeply. I’ve run skyship campaigns, but I never a game where the players spent significant time on the ocean in a conventional ship. I've skipped on pirate or exploration games. Perhaps because of that, I’d dismissed Citybook II. I recall looking at it on the shelf and not buying it. When I decided to review this series, I had to hunt down copy of this. I quickly realized what a mistake it had been to skip this. Port o' Call is a solid entry in the series, with some idea I wish I’d seen years ago. The 116-page perfect-bound supplement sticks mostly to the design of the first volume of the series. I have a copy of the first printing, with a more rigid cardboard stock than Flying Buffalo later used. They also print on the inside of the cover, adding two extra pages. 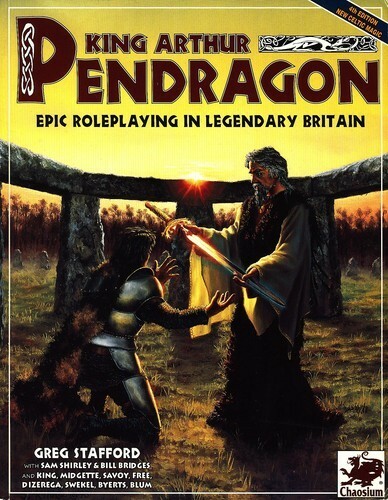 Noted fantasy cover artist Carl Lundgren provides a well-executed but generic cover image. Liz Danforth returns with the majority of the art duties. Her art shows up better this time. In the last volume her soft pencil sketches washed out. Here they look sharp and she alternates between those and darker, inked images. Steven Crompton and Dave Helber assist on art duties, primarily as far as I can tell on diagrams and maps. It is worth noting that the art in the book offers a diversity of genders, body types, and ethnicities. It does a much better job of presenting a diverse place than many more modern books. Layout and text design follow the same solid two-column approach as the last volume. However the text size has shrunk, so there’s much more material here. The maps look good, driving the text design in many places. Liz Danforth and Mike Stackpole edited the collection which has 22 entries, written by 21 contributors. 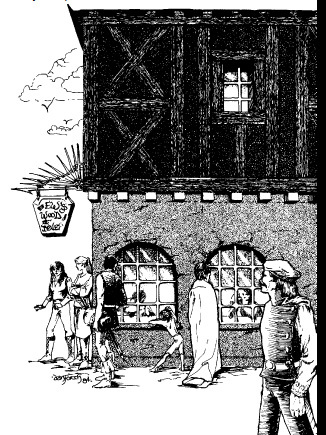 Notably we have an establishment written by Dave Arneson and one by Charles de Lint. The book lays out the map keys clearly. The generic system for describing NPCs remains the same and it works. The book lacks an index, but has a solid table of contents. One page at the end offers suggestions for connections across various establishments. One is a scenario that feels more than a little contrived. The other offers some interesting what ifs that set up events which have fallout across the different locales. I prefer the former. Several of the entries in this book take a conventional approach and simply run with it. For example, Cap’n Bill’s Bait Shop pretty much is what it is- and I like that. The GM has room to make it deeper or more complicated, but I appreciate a place done as a kind of solid example of the lives of people in the city. In the other direction something like the Longtooth Lounge (by Arneson) throws a lot of different magical and political complications at the wall. It holds together, but just barely. There are a couple of places in the volume where I found myself thinking that X or Y detail could be cut and maintain the same tone. We have the fallback to the evil wizard in disguise/amnesia trick that we’ll see in just about every volume for example. Four establishments remain in my mind after reading- keeping me thinking about how I might use those stories. Sails of the Everpresent Journeywind I didn’t expect much from, but the backstory on the owner is dark and tragic. Cursed with immortality until she completes a quest- at which point and even worse fate awaits her. And then there’s her wizard lover who has been trying to find a way to remove the curse. He’s kept himself alive through magic but has begun to grow senile. It really got to me. Their story loosely connects with The Temple of Aroshnavarapata. That’s another great bit, with some interesting divine twists. GMs will have to figure out how the cosmology of that fits with their world. I like the idea of a god who has lost his place trying to figure out a way back in- the same god who cursed the sailmaker. Two other establishments have nice domestic stories which make for great NPCs. Van Iversen’s Lite offers some hooks into the political life of a city. It could be used as great motive, especially if the PCs befriended those characters. On the other hand, Robab’s Fish Market presents a domestic story crossed with a magical one. It didn’t go in the direction I expected. The various NPCs have strong desires and motivations, with some secrets they want to keep. The material’s structured well enough that I could immediately see several different ways to play that out. I should also note that the presentation of very different ships- along with their crew and deck plans is awesome. If fits with the book and presents a resource a GM could use over and over. There are a couple of clunkers in this volume; The Pearl Trader, for example, really doesn’t go anywhere. But generally each entry offers at least one interesting story, and most offer more. I love the movement of the Citybooks to themes. Connections appear within the various establishments, easily used or ignored. 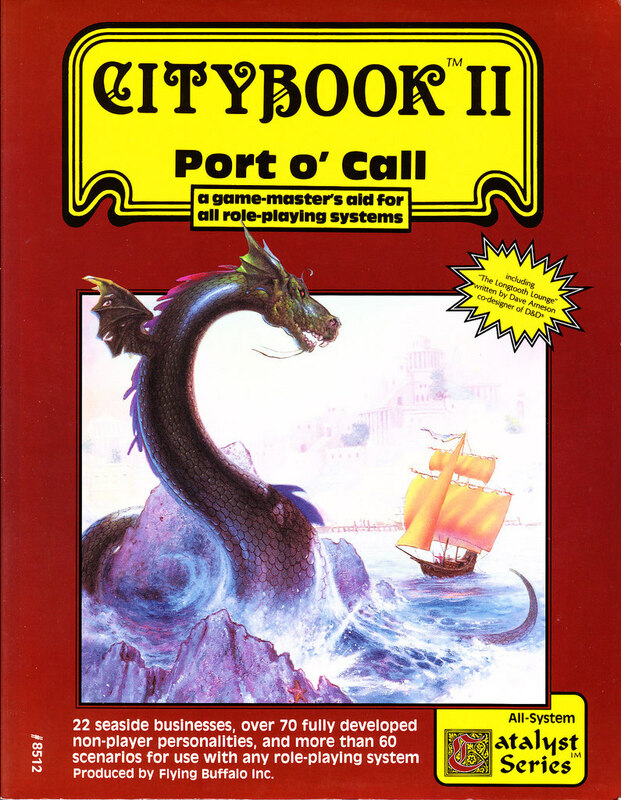 Citybook II: Port O’Call handles port setting well- shifting the material to match those needs (for example, presenting ships & crews). It holds together even better than the previous volume. Having so many different authors acts as a strength, rather than a weakness. Each brings solid and inventive ideas to the city. I also think the material here could easily be combined with the “Barran the Monster Hunter” scenario from one of my favorite modules, Strangers in Prax. Most of the material here could be added to any great port city setting from Waterdeep to Umbar to Marienburg. This Saturday I finally had the chance to run Hollowpoint. We had a break between campaigns, so I wanted to do a one-shot with something pretty distinct. Last time we’d done Dread, another game with a pretty central and different mechanical system. In the near future, monsters are real. That discovery by various secret organizations put them in a difficult position: pull back the curtain and cause panic and an all-out war or find a way to create quiet balance between the monsters and humanity. You belong to one of those organizations, dedicated to enforcing the rules and keeping things under wraps. That agency is simply known as The Balance. It employs deadly and expert agents, called Exarchs, to carry out missions. It fights against the Vampires, Werewolves and other creatures of darkness who act as a supernatural mafia. The Balance allows the creatures to carry on, but within limits. When the beasts go out outside those limits they send in the Exarchs. To the basic set of six skills, I added OCCULT- presenting magical knowledge and the use of sorcerous powers. The two effect stages would be Cursed and then Soulless. I did up little 4x6 two-sided character sheets, with a quick outline of the conflict mechanism on the back. At the table I walked through the game, stressing the broad approach to actions. They made up their characters pretty quickly, with a couple focusing on KILL, one on TERROR, one on COOL and the other on OCCULT. There were some interesting traits chosen as well and I pretty much let anything fly there. I got down to brass tacks and described the mission. Their agency, the Balance, keeps the existence of monsters quiet and maintains balance between groups. In Chicago, that balance has gotten skewed. Vampires, in their ongoing war with the Lycan Werewolves, have gained the upper hand. Objective One: Restore parity between the Vampires and Werewolves in Chicago. Though is isn’t clear if it has a role in the current imbalance between the two forces, an important magical artifact has surfaced in the Windy City, the Tome of Asmodeus. It is likely in the hands of the Vampires. Objective Two: Locate and retrieve or destroy the Tome of Asmodeus. They wrote up complications. I made a mistake and didn’t stress that those should connect themselves to the mission objectives. A couple of people, in a more Microscope-y, way wrote up more general complications for the story. Those were great and I might have to use that as a technique in the future. But I had them revise those to make them more personal. I moved the players on to the scene, allowing them the choice of where and how they wanted to hit things. I stressed again that each conflict meant that later conflicts would be tougher. The players also noted that they wanted to avoid a wash. They did some research- I allowed them to make a skill check. The Hollowpoint rules suggest successful skill checks count as successes for later scenes- adding more dice. I opted to only apply that raise once. I wanted players to have some ability to choose actions and roll even during the discussion sequence. They got the basics on the Vampires. I borrowed from classic WoD, so we had a Giovanni family in control of the city, with mafia contacts. Cantor Giovanni was the patriarch, with son Petreus Giovanni as a right hand-man and warlord. His other son Michael Giovanni didn’t seem as involved with the current conflict. There were indications of smaller rival vamp families, a detail not used. On the werewolf side, the tribe of the Silver Fangs was led by a Lord Steelbane. They got less information on them, except that they had a street gang of weak-blooded werewolves (metis) known as the Born-Broken. They seemed like a good point of engagement. The group also researched the book and discovered it had rituals relating to the powers of various monsters and rituals for enhancing them. The group opted to use the gang as an entry point. Three went into the club to roust them, using COOL and TERROR. Two others worked on DIG (looking for evidence in backrooms) and OCCULT (reading the wards and magic around the area). It took a couple of rounds, with the group taking a couple of effects (Terror, Dig) before they finally cowed the gang leader Angor Sept. The players started to get their feet under them, and we had one trait burn in that conflict. The PCs forced Angor Sept to set up a meeting with the werewolf lord, Steelbane. They met at an abandoned amusement park. Lord Steelbane had some of his pack with him, along with his second, Viska Sloane and his daughter, Selena Holt. The PCs suggested that they shared a mutual interest in hitting the Vampires hard. There was some agreement. They found out that the vampires victories had been more due to strategic intelligence and ambushes than anything else. Steelbane suspected some magic, since he’d vetted and checked his own people for a leak. Viska reacted oddly to this comment, but the group let that pass for the moment. They pressed Steelbane for where they could locate Petreus Giovanni, if they wanted to send a message. He suggested the vamp-only stronghold of the Succubus Club. The PCs departed. The group headed for the Succubus Club, intending to approach with a mix of skills- half the group playing hardball while the others went more quietly in. However, they drove into an ambush on the street outside the building. Someone had tipped off the Vampires. They raked the PCs vehicles with gunfire. The opposition included Petreus Giovanni, allowing me to split my dice pool. The group responded by going full KILL for everything, intending to simply eliminate any and all opposition on the street. They burned traits and asked each other for help- piling up dice in two-three persons (of five) each round. My group’s pretty focused on cooperation, so despite the attraction of saying FU, they went with a united front to start. They quickly made a mess of the opposition- dealing a second stage effect to the general Vampire group, and a first stage effect to Petreus- at which point I had him withdraw. I did manage to couple of solid KILL hits on one of the PCs, but the players began what would be the key strategy for the evening. If anyone took a second-stage effect, the other players quickly distributed that using their Agent ability. Having successfully dispatched the Vampires, the players opted to immediately continue and escalate the situation- driving straight through the doors of the Succubus Club. The group split between KILL and TERROR, with one player using COOL. Once again, dice consolidated in players hands through the teamwork mechanic. I didn’t have a split dice pool (no protagonist) so I ended up with some big numbers that went fast but left me with little. I dealt a couple of effects, but nothing awesome. The team set the Club ablaze, until finally they dealt a second stage COOL effect- forcing a Vampire to beg them for rescue in exchange for information. The group drew information from the nameless vampire. He indicated that Petreus had been told that some kind of enemy would be coming to the club, and so set up the ambush. The nameless vamp suggested that the information had come from Michael Giovanni, narrowing down the source of the leak in the werewolf community. One of the players (“Jake Boswell”) burned a trait, Flashbacks, to establish that he had a previous relationship with the werewolf second in command, Viska Sloane. I let him make a roll based on his CON 2. He ended up with two sets on four dice so I let it fly. Viska indicated that the Lord’s search for leaks hadn’t included his own family. She offered the group the location of the ambitious Selena Holt, the lord’s daughter. The group breaks in to the abandoned warehouse where Selena Holt and her packmates doss down. They use a mix of skills, but the focus is clearly on KILL. The group has begun to really see how the effect stack- and they try to coordinate their work, rather than hitting the opposition on all fronts. The net result is that they finish things with a second stage KILL effect, which leaves Selena Holt dead- and unable to answer questions. However they uncover evidence linking Selena Holt and Michael Giovanni. The pair wanted to get ahold of the Tome of Asmodeus, which Cantor Giovanni keeps in his vault on his fortified estate. They planned to use the book’s rituals to empower themselves. They got some strategic information on the estate as well. The group wanted more information on the book, and the potential magical safeguards as well as confirmation of the book’s presence. They wanted to check in with occult sources in Chicago. I offered two options: take time and make an Occult skill check to get some details OR go and kick in the doors of the various amateur warlocks and witches in the city, full conflict style to get the answers fast. The group opted for the latter. Despite the pretty huge pool of dice I had, they ran roughshod over the occultists pretty quickly. I distributed a couple more effects, players burned traits, and we had some dice finally taken from the teamwork pool. The group coordinated their FU’s to get at that. They got some more details- most importantly that most of the arcane protections were to keep monsters out. The party decided to take the fight to the fortified Giovanni estate. Once again, the group traded off support and assistance, with everyone pretty much burning all of their traits. They all also used their agent abilities to take various hits for one another. But I had 26 dice, split among two pools (12 for five players + GM, 10 for five previous conflict successes, 2 for their various skill checks, and 2 for a protagonist on site- Cantor Giovanni). The group worked through, getting a couple of effects and managing to clear the catch when everything went pear-shaped. I finally managed to take down on player with a second stage KILL effect on one round. No one had any room left to take his hits on sets or skills. That lost them his dice. The next round they took from the teamwork pool but I managed to overwhelm them- I hit three more with KILL effects. They’d already take stage one hits for others before that so suddenly they dropped like flies. But that day was in the future, and they’d managed to accomplish at least one of the missions. With a new group, I suspect you’ll find yourself dealing with the mechanical side of things on your first session. We ended up with less narrative in this game. I think that would be different if people knew the system and were ready for it. If you’re like me and usually try to rush through combat/conflicts to keep the energy up, you’ll need to slow yourself down. Take the time to describe and narrate the moments. It is easy to forget about complications early on. Or at least I did. I would stress players’ ability to withdraw from scenes earlier- and that doing that doesn’t raise the stakes for the next conflict. OOH player’s don’t like to withdraw. More importantly, I would point out that “moving on” allows the player to come in with a fresh and clean character. Because they’d used their Agent abilities to take hits for one another to keep them in the game early on, they were all hugely vulnerable in the final conflict. Players will learn and figure out the dice system- what works best and what doesn’t- as they play. I didn’t give any advice on this, except that long rolls went fast but wasted a lot of dice to do it. They probably wouldn't have gone to the dice with the Occultists if they'd more familiarity with the system. I enjoyed it, I think the players did, and we would certainly play this again. I think all told, even with a pizza break of about a half hour, we managed to do this in 3 ½ hours total. On RPGGeek, they've started a new initiative called Gamemaster University or GMU. Each week 2-3 contributors write on a particular GMing topic, and then offer an open discussion thread. I like the concept, as it draws multiple perspectives together and allows back & forth afterwards. This week I put together a piece on the topic of first adventures. I'm cross-posting it here. MasterGeek was kind enough to allow me to contribute to this week’s topic. I run two-three games a week, and at present have four campaigns ongoing. You can see the chronology of my campaigns here in two geeklists, one covering my ongoing fantasy world and the other everything else. As a GM I’ve moved away from detailed rules systems, to games with lighter mechanics. Along with that I’ve shifted to put more focus on story and narrative aspects over game or simulation elements. Different groups and gamers have different needs, and I want to make my approach clear at the beginning. For the topic “Running Your First Adventure” I’ve focused on first sessions- getting to them and running them. Negotiating the genre and system you’re going to run is worth of a topic of its own. So I’m going to assume that you’ve agreed on that. Now you need to lay out some details for the players. Campaign Description: Give them a sense of what kind of game you hope to run and what kind of campaign it will be: episodic, dungeon-crawl, long arc, big story, etc. If you’re going to be adding in uncommon elements to a classic genre- like horror or steampunk to fantasy- make that clear. Give your players an idea of the planned campaign duration: a few sessions, a longer arc of months, a year, or open-ended until the campaign wraps up. I’ve gotten into campaigns I expected to last for a summer that ended up going on much longer (and vice versa). A couple of times it felt like a bait and switch because the GM wasn’t up front about intentions. Rules Guidelines: Outline what rules you’ll be using. This can be a s simple as saying D&D 4e core rules. If you’re playing a game with significantly secondary or optional rules be clear about what you want to use or not use. If your group has invested heavily in the system, consider being more open in those choices. At the very least open a dialogue about that. As a GM my inclination is a narrow use of optional rules and classes to make it easier for myself, but players may have concepts they’ve been dying to play. If you allow that, you’ve earned some GMing goodwill. Think carefully before vetoing options. Fluff & Crunch: If you have house rules, character creation extra systems, background information, history, and the like for the players, give it to them ahead of time. However, expect that players won’t read that material ahead of time. Some may have, and some may have skimmed it just before the session. But often your background material and set up won’t have been assimilated. Coming in with that realization can avoid some frustrations. Be ready to go over it again at the table. Will you do character creation ahead of time, as a its own session, or at the start of the first session? Regardless of what choice you make, communication is essential- not just between you and the players, but among the player group. I’ve found letting players establish concepts and “call” roles ahead of time makes things easier in the long run. I usually do this in email- asking them to reply to everyone with what they’re thinking. It helps players who aren’t sure what to run see open niches. It encourages players to cooperate and negotiate about choices. It also fosters a sense of teamwork before the game starts. Pre-generated characters: These can be a time-saver, especially if you’re planning on running an experimental or short-term campaign. Perhaps the players are new to the system. Perhaps you picked up a great module or introductory adventure which has characters balanced to the challenge. If you do this allow the players some choice or swapping. You can afford to be generous on this and some players have character types they really don’t like. One pre-gen option is building characters yourself based on player input. This has several benefits. You can balance choices and abilities between individual players. Your sense of what the group can do improves. 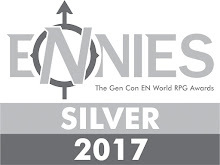 You save yourself time at the table while still giving the players choice. I’ve done this with higher crunch systems ( Champions, Mutants & Masterminds, Scion), especially with players new to the system or where some have an advantage in rules knowledge. I usually allow the players to swap and shift character details a few sessions in, an option even more important with this approach. If you don’t create characters ahead of time, you may be thinking you can have the players roll up characters and jump into play in the first session. That’s cute. Character creation expands to fill the time permitted. If your character creation is more than a few picks, some assigning of numbers of the like, strongly consider having a session devoted solely to that. Some games, such as The Dresden Files RPG, have made this a necessary and multi-layered experience, assuming a full session for it. Character creation always takes significantly longer than I imagine it will- made even longer if you have new players, a group inexperienced with the system, not enough copies of the rules to go around, more than a few secondary rulebooks, or any need for a calculator. I’ve found it more successful to have players talk about ideas and concepts before they sit down to roll/create characters together. They may change their minds in the meantime, but they at least have some sense of what others have chosen. I’ve used that to keep players from stepping on each other’s toes. Use the character generation session to answer questions about the game and ask questions about what the players want. The characters they choose and how they describe them should shape what you bring to the table. Make notes about interesting details they mention, along with their character’s name so you get in the habit of using that at the table. If players suggest a concept you think might not work with the game, address that now-- gently- ask them what they want to get out of the campaign and explain reservations you have. A couple of bloggers I follow have talked about this recently, The Githyanki Diaspora and Voices in My Head. Even if a character creation session ends up with time to spare, I usually hold off on running something immediately after. That gives me time to think about the characters and what will work for them. Are there stories I can connect to their backgrounds? Also, even if players know the rules, getting up to speed with new characters can take longer. Just keep that in mind. The group character creation session offers benefits, but presents a potential problem. If players miss that session, they can feel left out of the bonding. If someone comes in later with a character built outside the circle, some players may suspect they had a mechanical advantage. I recommend having new players partner up with an existing player during character creation, rather than the GM. Some of what I’m going to suggest is more general GMing advice, but I will try to focus on the first session. Your first session is a chance to set the tone, hook the players and establish how you want sessions to go. 1. Agile Prep: Don’t freak out and over prepare. I used to spend hours getting ready for sessions. But over the years I’ve come to realize that I will use only a portion of that material. Now I brainstorm, outline ideas, and sketch out scenes very broadly. I loosely write out the details of the opposition, focusing on what makes them interesting. Quick Set Up- Incident/Conflict- Choices/Interactions- Second Conflict is a common pattern I use for first sessions. Your results may vary, depending on the rules crunch for your game. 2. Basic Knowledge: If you’re running from a module, don’t worry about memorizing everything. One trick I use is to read through and make a simple outline to refer to during play. That helps you see at a glance how scenes or elements connect together. 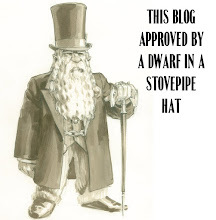 I also create a list of NPC names and their role as a play aid. Avoid restating things like descriptions or box text from the module verbatim; that always feels flat. 3. Character Sheets: Make sure you have a copy of everyone’s character sheet. It might be rude to say, but that keeps the players honest and makes prep easier for you. You can roughly update changes from time to time over the campaign. 4. Dispute Resolution: Establish in the first session how you want to handle rules disputes. Generally my approach is that during play, if I make a call it stands. Players should, however, feel free to point out and correct rules decisions after the session. This maintains game flow while allowing the group to fix problems. I’m not a fan of flipping back to the rules while we’re playing. From time to time, I’ll also ask players to make a rules call or ask for their rules knowledge. That keeps them involved and demonstrates I respect their skills. How you handle this may vary, but be sure to establish your method through example in the first session. 5. Expect Questions: Know the rules. That doesn’t mean being an expert or knowing every situation or modifier. However you should understand the basic mechanics and be confident enough to make rules decisions during play. If the system uses skills, know what those are. Figure out what are standard difficulties for actions. Most importantly know the basics of combat and conflict resolution. 6. Food Formulas: If you have other rules or house procedures, or even a group contract for behavior, set that up before you even roll the dice. Your group may have guidelines about electronic devices or delicious snacks. Do dropped dice count? Restate those rules before beginning play. 7. GM Methodology: Use the first session to make clear your methods. Screen/No Screen? Dice rolled openly? More or less lethal about combat? Some GMs take players away from the table for secret stuff, some write notes, and some state it openly- relying on the group not to take advantage of it. Show how you’re handling that. If you’re working with a new group, keep in mind they may have very different expectations about that. 8. Have Openness: Be open to the players’ input as you run. If you have the chance, I recommend reading Play Unsafe by Graham Walmsley. I don’t follow his highly improv approach, but his book gave me more confidence about going into a session without everything written out. The key point I take from it is that a GM should respond to ideas in an open rather than closed way. The idea that a GM should say “Yes, but…” or “No, but…” comes from that. You don’t shut down suggestions, but instead accept or offer alternatives based on that. Remember to go to the dice if you’re uncertain about something- use randomizers to help with decisions if you’re unsure. 9. Incidental Details: For anything longer than a one-shot, the first session’s your chance to establish narrative elements. If there are particular ideas or themes (the fall of a kingdom, a decadent empire, man against nature, etc.) try to work those into the first session. Given that there’s so much for the players to take in, keep this low key. 10. Justify Them: Come in with a sense of the characters, especially their names. Try to have at least one hook or moment referring to their character in particular. That establishes you’ve paid attention to their choices. 11. Killing Time! : I almost always have a significant conflict or combat in the first session. It tests out the rules, forces the players to work together and shows the group my running style. It also adds energy and action to hook the players. 12. Launching Mechanics: First sessions should show the players how things operate. If your system uses skills, then have some skill challenges. If NPC interactions are going to be important, then present some NPCs for the group to react to. If the games going to be about mysteries, dungeon crawls or the like, come right out of the gate with that. 13. Maintain Parity: It can be hard, but try to pay attention to how much action each player gets. Players don’t necessarily have to have the same amount of time “in the spotlight” but they should have relatively equal opportunities and chances to do things. Table management may be the most important skill a GM can have. 14. Now This! : Getting the characters together and establishing motivation can be a challenge. So skip it. Begin the session in the middle of things. “You hired on for various reasons to guard a caravan, suddenly in the middle of the night you hear a scream…roll for initiative…” Then allow the players to ask questions and establish where they’re at as they take actions. Throw the players into the soup together with shipwrecks, earthquakes, sieges, shared amnesia, wars, collapsing dimensions, prison breaks, firestorms and the like. You begin right away with energy and worries about motive become secondary. Conflicts build drama. 15. Optimism Engaged: Remember that most of the time, your players want you to succeed as much as you. I’ve done a couple of posts on my upcoming hack of Scion to the FATE system. We’ll be trying that out in a few weeks- my goal is a six session mini-campaign, something more akin to a long movie or a mini-series. I figured out the skill list and I’ve managed to break down the other tasks I need to complete before the campaign starts. I used to be a rules crunch gamer- thinking about modifications for Rolemaster and Champions, and working out systems for Storyteller and M&M. I kept trying to figure out emulation engines and details. Once I detached from that- primarily because those things I built got in the way of table play - I stopped tooling around with those kinds of rule exercises. Instead I’ve shifted some of that energy over to setting and system hacks, trying to extricate elements I like from those places and making them easier to use and engage. Of late I’ve been playing with FATE for a couple of reasons. I can bend it easily and my play group likes the elements I’ve introduced from it. I know some gamers don’t care for the narrative declaration and player control (making it less useful for horror or tension games). However I think changes can be made to it to reduce those elements pretty easily. I’ve also been working with FATE because the mechanical principles are pretty easy to port over to our house system, Action Cards. That means that any work I do might be useful for other people and easily applied to our games. So here are two separate adaptations I've been thinking about. Adventure! 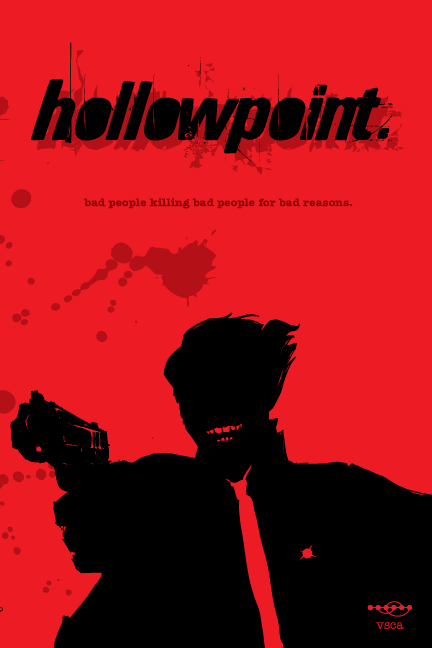 From WW was the last pulp game I ran- I think a two or three session mini-story. That was decently fun and the game has good ideas in it. I especially like the power allowing characters to return from the dead next session- so long as no one actually saw the body (fell off a cliff, tumbled into a volcano, etc.). I’ve thought about doing a more pulp-oriented Trail of Cthulhu in the future. But for some reason, the Crimson Skies setting keeps popping up for me. I never played the board or clix game (though I have pieces from the latter). I did play the PC game (until a never fixed bug rendered it unplayable…FU Microsoft) and the awesome Xbox game. I like the setting- and think it would be fun to play in that for a mini-series or side story. 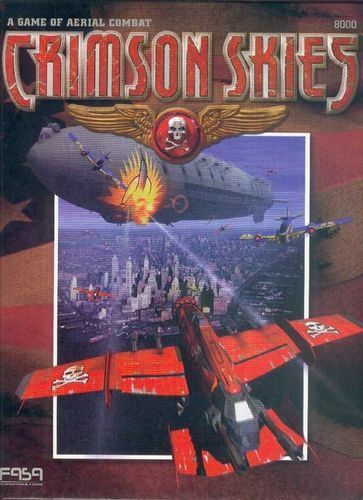 On one level, Crimson Skies would be a pretty easy adaptation. Spirit of the Century already covers pulp action, so I could use that with just a few tweaks. The WizKids CS rules had a pretty good setting summary in them, IIRC. If I can track down my copy of that I would be in business. Having a condensed setting overview would save me time in selling it to the players. The more complicated side of things comes from the planes and air combat. Obviously each player would have their own plane- that would be a requirement. To simulate vehicles, I can see two approaches. First, keep it pretty simple. Planes just offer a few modifiers, but the players run their characters as is but the environment shifts to in the air. Second, bring the planes more to the foreground. Planes have their own aspects, skills, stress tracks and even stunts. I lean towards the latter, even though I’m no fan of vehicle building systems. Strands of FATE spends a great deal of time on those issues. While it has some neat ideas, I want to keep it relatively easy to use. What I want isn’t universal vehicle building, but rather a system for the players to create, kit out, and advance their planes. Players would still fall back to their characters’ skills (and potentially aspects) to supplement that. I’d probably take the same approach with a Mecha style game. I’m thinking I’d come up with a set of airborne “maneuvers,”- that offer specific aspects, effects or the like- but still pretty open ended. Planes might have stunts giving them bonuses to specific maneuvers. I can see a couple of ways to handle how the plane to plane combat actually works. If I want it to be really abstract in a fight, planes would only track their distance to enemy planes (Close, Medium, Far, or Out of Range). Each player would exist in their own effective space. My distance to plane X would have no bearing on your distance to plane X (or any other plane). That might simulate the chaos and speed of these kinds of combats. I could track distances with something like a matrix and pegs. That approach does eliminate some of the visual possibilities. I have some of the plastic CS planes, so it seems a shame to not use them. It would be better to have a system where relative distances matter. In that case, I could make up a “sky zone” map sheet. It would be something like a dart board. In the center you have a circle, then a ring outside that divided into four quadrants, then another ring divided into four. Each quadrant (and the center) would be a zone. You could measure ranges that way- and determine who could assist whom in battle. A fight could have zone tags, like Mountains, AA Fire or Buildings (and perhaps move). Or players could add them to the fight as it went on. You’d also need a mechanic for chases, escapes and disengagement. 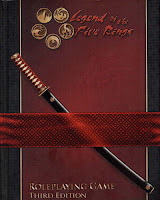 Some time ago I started doing some thinking about how to handle an adaptation of L5R using HeroQuest 2e. In the end I spent some time on it, but never went further. HQ2 would have been a significantly departure from what we’d been playing and several mechanical details made it not the best fit. So I set that aside, but still wanted to do something with L5R. Previously I’d hacked the material onto Rolemaster (yes, seriously) and Storyteller both with some success (or at least I got some good sessions out of them). FATE offers some interesting possibilities, and like HQ2 provides excellent instruments for handling non-physical combat. So what will require the most work for this hack? The skill list in L5R is pretty extensive. L5R 3e consolidates the list down significantly, but it still comes in at 42 skills. My Scion/FATE hack ended up with 28 skills and that’s the upper end of what I’m comfortable with. To reduce the number, some skills will fall under others- as a kind of minor stunt. For example, Tea Ceremony +2 or +3 might be a stunt affiliated with Etiquette instead of on its own. Know the School ought to be associated with combat skills rather than on its own. Traps could be a specialization stunt under Engineering (or as a bonus for attempts without the Eng. Skill). L5R 3e has “emphases” under skills and this mechanic would echo that. These should be pretty easy to emulate, although some of the combat heavy effects might have to get rewritten since they often do the same kind of thing at higher levels. Each rank within a clan school would be a stunt. These can easily be simulated by initial skills or even better by particular aspects. Some of these can be handled as aspects. Some can be done as stunts. Disadvantages are more tricky- mechanical effect disads can be pretty serious. It’s also hard to qualify any aspects as entirely negative, but perhaps I could put together a list of options- players could take an additional flaw aspect (or two) to offset their refresh pool and get more stunts. I have to think about this. I like the L5R mechanic of focusing vs. strikes. I also think any duel ought to have at least three stages: sizing up (perception), psyching out (mental), and the actual contest. Perhaps there could be a running total among the stages, acting as a modifier to the final result? Should Fate points be used in the final strike- part of me thinks that it shouldn’t. This might actually be easier to handle than in HQ2, which handles these powers abstractly. Shugenja of a particular clan would have an elemental affinity- likely a straight bonus with those kinds of spells, and an elemental weakness- penalty with that element. Most of the shugenja skills have associated strengths (Crafting magic for the Asahina, Ward Lore for Yogo) which would be represented by an aspect. Spells would be minor stunts (like the skill emphasis I mentioned above). Every two take would reduce the character’s refresh pool by one. Spells would be written pretty broadly, ala Dresden or Exalted. L5R itself comes close to that but ended up with more spells than they needed. Shugenja would be able to modify the effects of a spell with spin, margins or increased difficulty. I like returning the focus to the magic users having just a few spells that they have to manipulate for effects. Dresden Files has some ideas, but I'm not completely comfortable with their model. I’d have to ditch some factors of the L5R experience, probably beginning with Insight rank. Honor would be measured as a kind of social stress- which could be raised or depleted based on actions, events or conflicts. Part of a players honor could be measured in abstractions like positions, offices, supporters, and the like. A player could take damage on those tracks- serving as a kind of plot stress. When too much damage is taken, it calls that thing into crisis, at which point the player has to deal with it or let it fall away. That’s borrowing from the plot stress concept of Legends of Anglerre. Glory, on the other hand, would actually be a skill. It could be subsided in for other interaction and manipulation skills in conflicts or otherwise. Each + of the Glory skill would have stress associated with it. If a player gains glory, they add boxes to their Glory stress until it reaches a certain level. At that point the skill goes up by one and they reset the boxes. Likewise taking glory damage, for failures and the like, knocks out glory stress boxes and potentially reduces the Glory skill bonus. 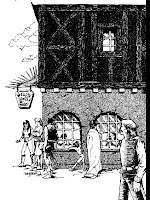 Sourcebook presenting city-based establishments for any fantasy rpg. I date the real start of D&D to 1976- I know they published books before that, but Christmas of 1975’s when my dad gave my sister the little three-book set. So I count 1976 as the first big year, the year it really started rolling. I'm amazed when I look at just six years later- 1982 and see the kinds of cool, intriguing and mature stuff coming out: Star Frontiers; expansions to Champions; Dragonquest 2e; Universe; Man, Myth & Magic; Rolemaster; Fringeworthy…crazy. Thirty years ago. 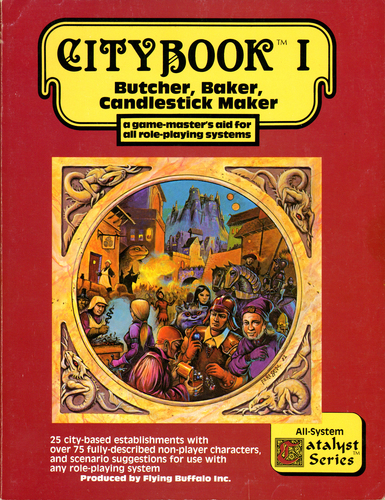 1982 also saw the publication of Flying Buffalo’s Citybook I, which would lead off an awesome series. We’d had some interesting city-based material for RPGs in the years before that: The Free City of Haven; Thieves World; Cities by Midkemia; and City State of the Invincible Overlord among other Judges Guild products. Citybook took a long view- offering generic material for any fantasy campaign, created by professionals, an anthology of ideas from excellent writers. I keep my eye out for urban adventure material- I love the idea of campaigns based in cities. I’m pretty widely read in that- but the Citybooks are where I start when I think about running adventures in metropolitan settings. Other books might offer overviews of how a city functions, set up specific mysteries or crimes to be solved, or offer random tables for generating populations and encounters. But the Citybooks offer strong and adaptable stories. I plan to review all seven volumes of the series, since they have different themes and different strengths and weaknesses. So what are the Citybooks? Each volume presents generic businesses, locations, and organizations for a fantasy city. The books aim to keep assumptions about the nature and form of fantasy pretty generic. Even when it deals with the cosmology of the magic, it maintains an open and adaptable approach. While the books are written without specific system mechanics, they offer guidelines for important details. Fighting, magic and so on are ranked to give the GM a clear sense of the relative power. Each entry is usually at least three pages, usually more. Most include clear maps and layouts with clear icons. An entry usually includes a basic description, layouts, NPC details and most usefully a set of scenario suggestions. NPC write ups focus on personalities and plot elements. Each book usually offers a set of links and threads to make it easy for the GM to connect different establishments together and create larger stories. These can easily be used or ignored. 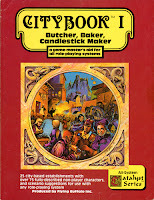 Citybook I: Butcher, Baker, Candlestick Maker comes from Flying Buffalo’s All-System Catalyst series. FB keeps the whole series mostly in print, depending on the vagaries of fate. The 128-page perfect bound volume has gone through several printings- later ones like mine offer an index of business running up through Volume IV of the series. They also have a more flexible stock cover, making the book easier to flip through. Stephan Peregrine provides a nice and simple cover illustration. The amazing Liz Danforth offers most of the interior illustrations. She’s one of my top five favorite rpg artists. Unfortunately some of her pencil sketch images end up washed out in the printing here. Steven S. Crompton, who many might remember from his work on the Grimtooth’s Traps series, provides additional illustrations and the location maps. The layout and text design is very much of that era- simple clean and functional. The page is filled with material, but not too densely. Editor Larry DiTillo provides most of the entries in this volume, along with a handful of other contributors. As the most generic Citybook, CB I sticks to the basics. Business as set up as backdrops- places and scenes for the players to provide some depth and detail to their urban exploration. Most businesses have at least one twist or hook (such as a ghost, secret agenda, hidden magic, or lost wizard) which the GM can use at their discretion. My favorites from the book are the Rumpchunk’s Butchery and Skywhite’s House of Lavation mostly because they present business I hadn’t thought of at the time. I can imagine those as colorful scenes. For the first, players might need some rare monster cut up to sell without loss of value. I could see a later scene for a group of hardened PCs who suddenly need to make themselves presentable. Anime-style bathhouse hijinks would be optional. I like where the businesses point at considering the implications of a traditional business within a fantasy setting- such as the taxidermist and the tattoo parlor. The Bellmen’s Guild also suggests a rich world of local organizations, dedicated to the life of the community and providing a rich source of interactions. Some of the business will be easier to add to a traditional fantasy rpg than others. The candlemaker, Gillian’s Fantasies in Wax or the oddball Temple of Putrexia will require some engineering- probably directly linking their elements to a story or plot. A few of the business seems a little too generic- for example the Diamond Spider Tavern. Some material will require the GM to consider how to model, like the bar games presented or the race across town scenario suggested in Korbo’s Transport. A few of the entries have fallback twists which will reappear in later entries in the series (amnesia, for example). Despite a few flaws, the book holds together well. Especially good are the NPCs who feel fully-fleshed. A good NPC has to have goals and objective- which don’t necessarily match those of the PC. Each presented here does, with scenario ideas arising naturally from those. The book ends with a page suggesting four scenarios which cut across multiple businesses. I like those and appreciate that those connections have been kept to the end, rather than in the individual entries. That allows a GM to pick and choose pieces without feeling like they’re losing anything. The Citybook series remains one of my favorites, and one that gets better as it goes along. This volume, which won the HG Wells Best RPG Adventure for 1982, has great material. That being said, many of the later volumes are even stronger than this one. Part of that comes from experience, part from tighter themes and part from a more diverse group of contributors for those books. Still, reading through Citybook I you’ll find great ideas for city stories and a hugely useful resource for any GM. Most importantly the book reduces the assumptions about the game world making it easy to cut and paste. Rather than building your city for you, Citybook I provides a way to do excellent finishing to your rough creation. I love this approach and wish it worked as well for non-fantasy settings.